Elite Glass Services offers a wide range of pet doors on the Sunshine Coast, including the latest microchip integrated design. We provide pet doors for cats and dogs of all sizes, and the products can be installed into timber, glass and sliding doors. We would take care of the installation job by measuring up your door and cutting an accurately sized hole into it to place the pet door. For glass installations we will replace the glass panel with toughened glass which is much safer for you and your pet. If the height of the pet door is a bit too much from the ground on the outside of your entrance door, we would recommend you to place an additional step, as your pet might need it. We, at Elite Glass Service specialise in installation of Transcat Dog Door into glass doors and panels, sliding glass doors, and wooden panels and doors. Having a 4-way system of locking, this uniquely designed pet dog door can be secured and locked from either or both directions. Due to the presence of magnetic catches, the flap does not open unnecessarily too. 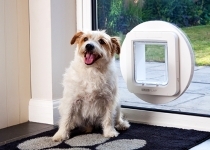 So if you have a lovely pooch at your house, why not get a Transcat Dog Door installed by us and grant your pet the freedom to go outside whenever they please! We can provide both small and large sized options as per the size of your pet dog. According to the size of your pet dog, we can provide you with small as well as large Transcat Dog Doors in Sunshine Coast. Besides that, our qualified professionals would also visit your home and install the product into your door for you. We can fit Transcat Dog Doors into glass panels and doors, sliding doors and solid wooden doors. Get the Microchip Small Dog Door outfitted into your main door and allow entry only to your pet dog. The Microchip Small Dog Door works in the same way as an RFID tracking system. The product consists of a reader that recognises an RFID tag present on the collar of your little pooch and opens up the door for them as soon as a match is found. 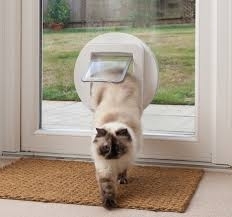 Besides small dogs, the Microchip Small Dog Door can also be used by those who own large cats. So purchase this excellent product from us and our professionals will arrive at your doorstep for ensuring an expert installation. 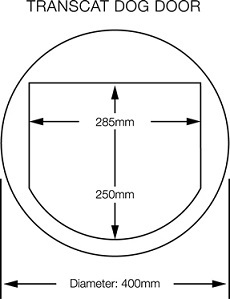 A hole of diameter between 294mm to 320mm will have to bored in the main door for installing the Microchip Small Dog Door. Prevent unwanted stray animals from entering your house by getting our Microchip Cat Door installed in your entrance door. This highly advanced and efficient device functions by learning the unique ID hooked onto a collar strapped around the neck of your pet feline. As long the sensors of the cat door do not detect the ID, the flap remains locked. We can extend our services to anyone living within Sunshine Coast. Works by using the advanced RFID technology. Can be programmed to recognise upto 32 microchips, in case there are multiple cats in the house. Incorporates an active transponder tag (battery-powered). Very easy to use, learns the ID of your pet cat at the click of a button. The diameter of the hole need to be made in your entrance door for installing the Microchip Cat Door must be between 210mm to 260mm. 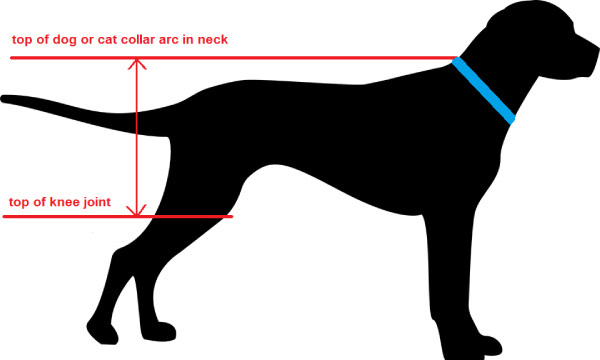 Measure the vertical distance from the top of the collar arc on neck to the top of the knee joint.